Locksmiths Available 24 hours a day, 7 days a week. 30 minutes response time! We are one of London’s prominent emergency locksmiths and offer a quality service at competitive rates. Residential, commercial properties , lock repair and replacement, key replacement and burglary repair including vehicle locks and vehicle emergencies. A reliable and affordable locksmith service wherever you are in London. Watchdog – are a leading auto locksmith in London and offer an effective fast and affordable solution to our residential and commercial customers. With a network of locksmiths we can get to your vehicle within 30 minutes. Stuck somewhere, car lock playing up or have damaged car keys? We will get you back on the road in not time at all. Call 0800 389 9965 and our car locksmith will be at your location in no time. Your time and money are valuable that is why we aim to get to you as soon as possible and treat every job like an emergency. We are here to help you in your hour of need. 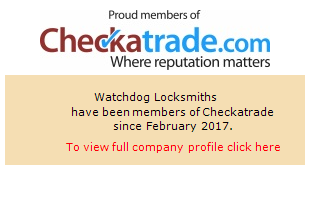 Watchdog is a leading locksmith in London. We repair and replace residential locks and help you gain entry when you have been locked out of your home. Call now for a locksmith in 30 minutes 0800 389 9965 for near instant help. We provide a 24 hour services so you can call us anytime and a locksmith will get to you in the quickest possible time. With years of experience and highly trained locksmiths, we have a solution to your problem so rest assured whatever the problem we can fix it.. Round the clock emergency locksmith services available at Watchdog! Night or day we offer our services to residential and commercial customers. Our locksmiths can usually respond within 30 minutes and solve your problems with locks and keys. Be it a faulty lock at home or your office, or a broken car key. No hidden fees, no call out charges call now and get a locksmith to your door within 30 minutes. We are a team of veteran and experienced locksmiths, offering a high quality solution at a competitive price. Reliable locksmith that too with quick services. Good and experienced locksmiths..
For a first time house buyer like myself, I needed a bit of guidance on how I could best secure my home. The person working at the store called Mitul was very helpful when informing me about the products that would be most beneficial to my situation. This is a great example of how customer service should be!! Would definitely recommend this place. Excellent service, good response time perfect service. Excellent service and very good professional work recommend to anyone value for money. Great service in store, very knowledgeable staff and very friendly.